BGP Large Communities are a novel way to signal information between networks. Large BGP Communities are easy to use, implement and deploy. An example of Large Communities is: 2914:65400:38016. Large BGP Communities are composed of three 4-byte integers, separated by a colon. This is easy to remember and accommodates advanced routing policies in relation to 4-Byte ASNs. This website brings together implementers and end users of the Large BGP Communities. RFC 8195 presents examples and inspiration for the operational application of BGP Large Communities. The document suggests logical categories of BGP Large Communities and demonstrates an orderly manner of organizing community values within them to achieve typical goals in routing policy. Any operator can consider using the concepts presented as the basis for their own BGP Large Communities repertoire. 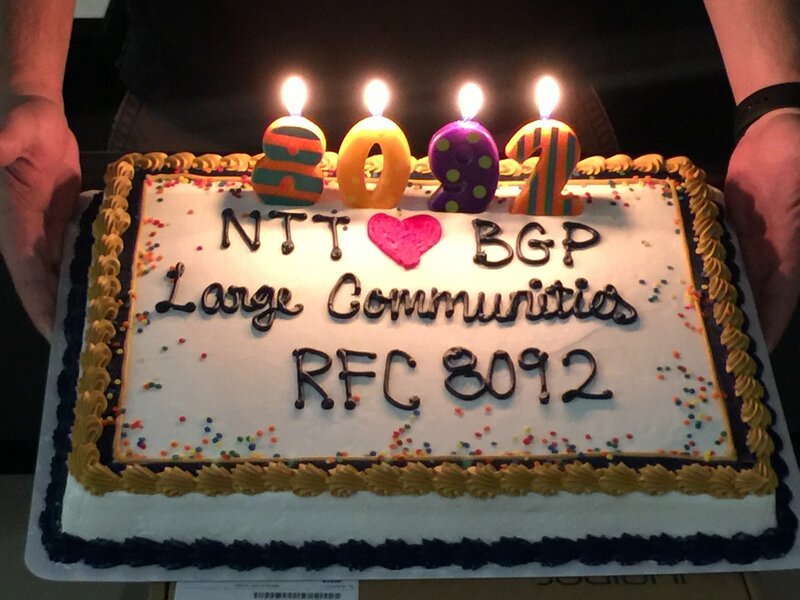 Final Milestone: RFC 8092 "BGP Large Communities Attribute" was Published! The almost final milestone has been reached in Large BGP Communities’ progression from an idea in early 2016, to an I-D, and finally to publication as an RFC! The IESG has just approved Large BGP Communities I-D revision -12 on the 2017-01-05 telechat today. Another milestone has been reached. The document survived the IETF Last Call and now the IESG Ballot has been issued to seek approval to publish the BGP Large Communities specification as a RFC. The European Commercial Internet eXchange (ECIX) has fully embraced, and deployed Large BGP Communities in production on all of their route servers. ECIX operates carrier neutral IXPs in 25 sites across five cities in Germany: Berlin, Düsseldorf, Frankfurt, Hamburg, and Munich. In addition, they provide customers with remote peering within and to Amsterdam, Luxembourg, and Nuremberg. Another milestone has been reached today, we’re only a few steps away from the Internet-Draft being published as an RFC! The Large BGP Communities specification has officially entered the In Last Call state. The IETF IDR Working Group governs the BGP specification. An important step that moves an I-D forward after WG Last Call has finished, is IETF Last Call and IESG Review to adopt the specification. The email below officially starts the next step towards publication as an RFC.